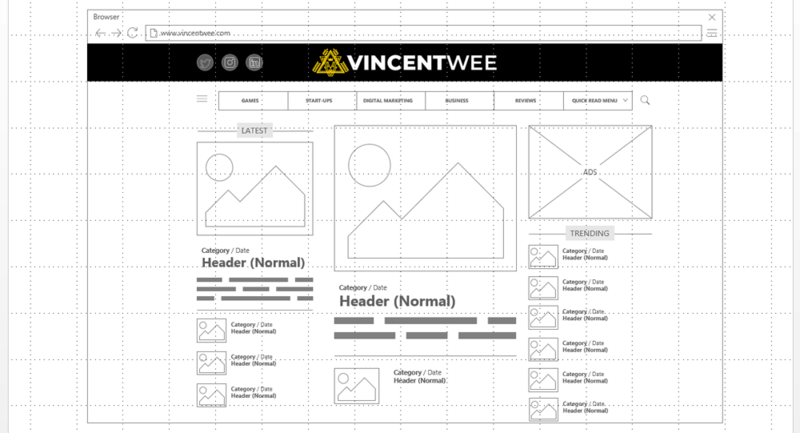 Wireframe exists to allow designers to plan and design a website/application at the structural level. Whether you’re new to the industry or you’ve been active in it for years, you’ve no doubt heard of this term. Many designers tend to dive straight into the design, from picking fonts and colors to choosing the imagery. But there are many benefits to kick things off from wireframing – although it is an additional step, it saves time, makes it easier to spot usability issues, and allows creating a solid user experience. 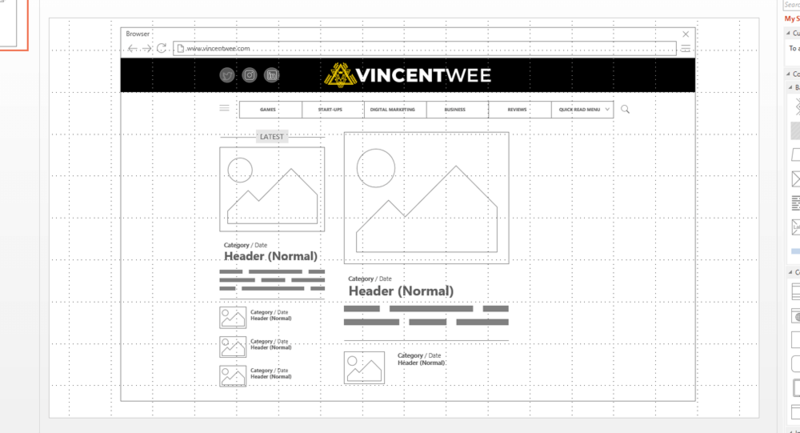 Wireframes are used in the early development process to establish the basic structure of a page before visual design and content are added. Similar to the blueprint of a building, it illustrates details of the digital product clearly and accurately. It is an essential step in translating an idea for a digital product into a reality. Other than using wireframes to plan out a project, it can come in handy when explaining to clients on how the proposed website or application works. Merely explaining through words or writing leaves the vast majority of functions to their imagination and also room for error. Wireframes are helpful in squaring this circle, making it easier for communication between project members or clients. 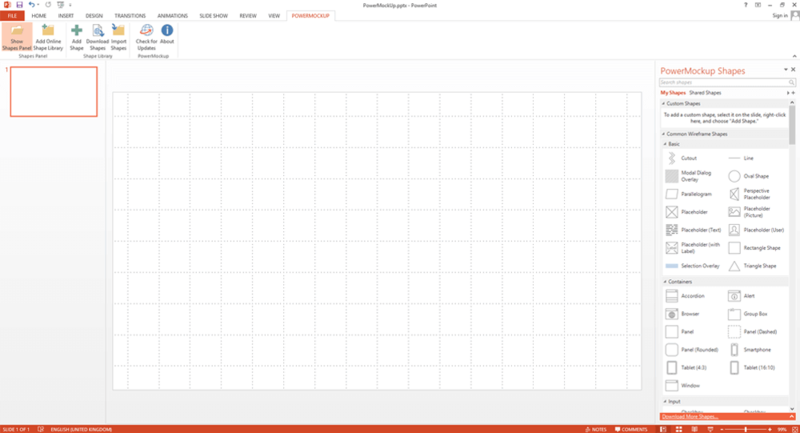 PowerMockup is a wireframing tool that makes building wireframes easy. It provides a massive arsenal of user interface elements and icons made entirely with PowerPoint shapes. 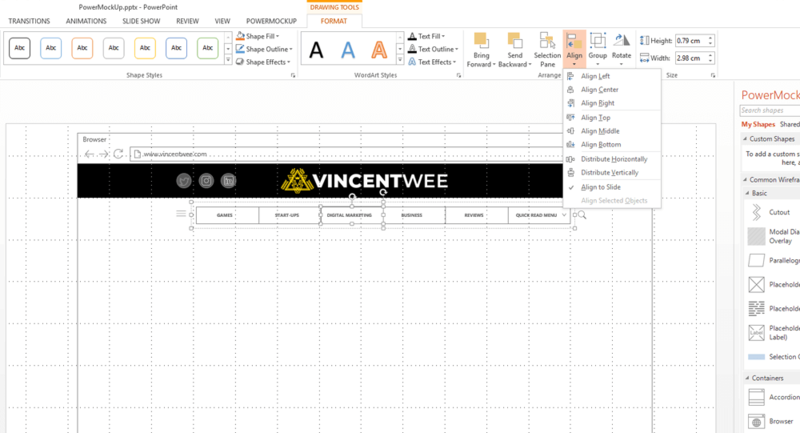 You can quickly build wireframes for your digital project from this library of elements right from inside PowerPoint. Installation of PowerMockup is effortless. Simply execute the program, and it will automatically install itself onto PowerPoint. When someone seeks to create a familiar user interface (UI), the objective should be to construct a simple process between the user and the product, such that it meets their needs, while providing a UI that is very intuitive and reduces the learning curve. 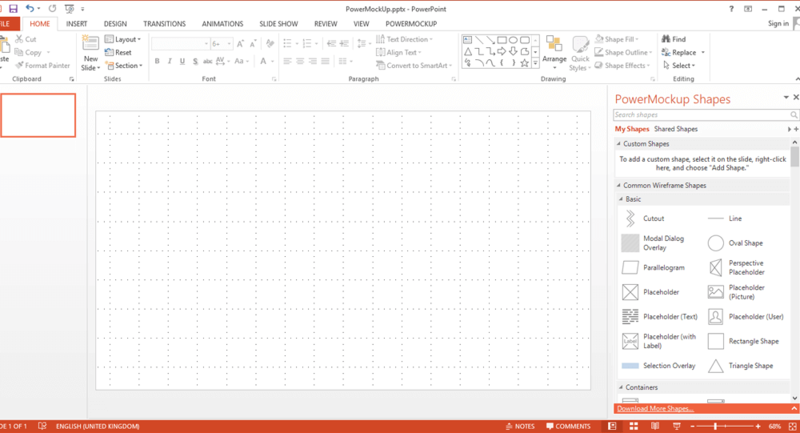 As PowerMockup runs on PowerPoint, the interface is basically Microsoft PowerPoint itself. It is brilliant as PowerPoint is one of the most used softwares for the majority of the professionals. Adding, removing and editing of elements is as easy as editing a PowerPoint slide. Comparing to most wireframing tools in the market, PowerMockup is considered decent with sufficient elements to construct the wireframes you need for your digital projects. Leveraging on a drag-and-drop method, you can easily choose what you need from the library and add them to the project at the desired location. No coding or training needed, you can build interactive wireframes and prototypes visually. 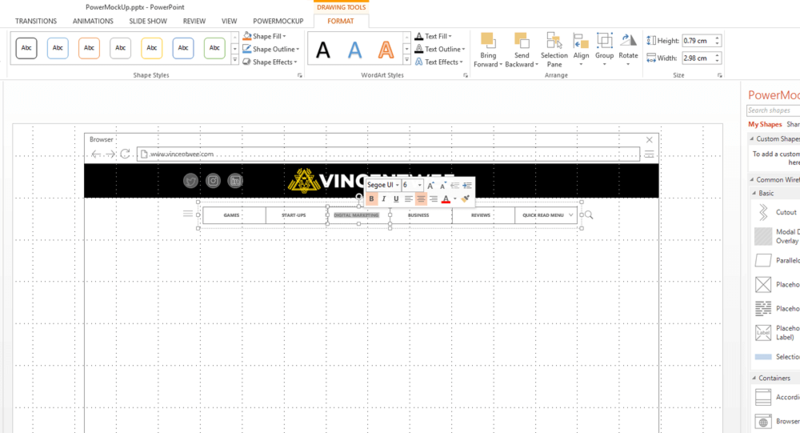 There are also guides/gridlines for element alignments and formatting tools on PowerPoint that can help in design consistency for your project. 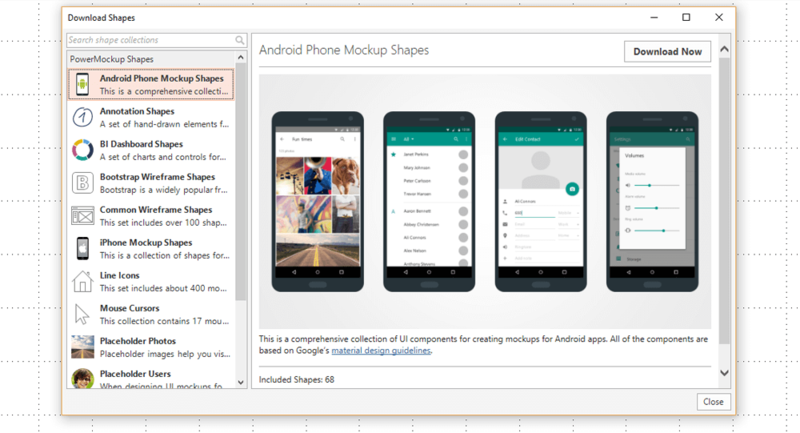 If you find that the elements that come with PowerMockup is not enough, you have an option to download more shapes from its database. You can also create your own items to the shape library. Simply select a shape on a PowerPoint slide, click on “Add Shape,” and you’ve added a custom shape into the library for future use. PowerMockup is a rapid wireframing tool that helps you work faster and smarter. It reproduces the experience of wireframe designing on a professional software, but using PowerPoint. Looking at the final product, who would have guessed that it is done using PowerPoint. It doesn’t take six years of study or a thick manual to use PowerMockup effectively. The simple UI and intuitive controls allow you to master the tool in minutes. 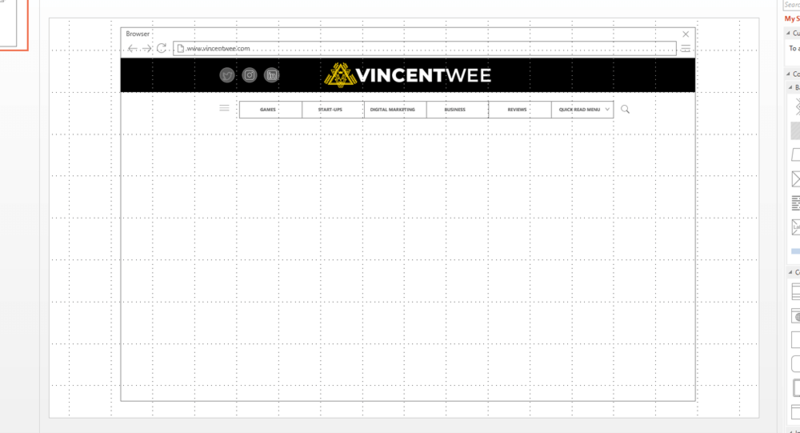 It only takes me 15-20 minutes to re-create a wireframe for my website.